I liked physics… for a little while. Its principles made sense to me, and the heavy use of mathematics played to my strengths. Plus the labs were fun: we slid objects across tracks and dropped them from heights. I had been doing experiments like that at home my whole life. I was particularly smitten by Newton’s first law of motion: “Every object persists in its state of rest or uniform motion in a straight line unless it is compelled to change that state by forces impressed on it.” The law is a powerful tool for understanding why and how things move—or don’t move. From this foundation, one can anticipate how differing forces might change the speed or direction of travel. Economics is not a natural science, and the phenomena we study do not lend themselves to tidy equations. But Newton’s first law may explain why the year ahead of us might be difficult to manage. Forces acting on the speed and direction of the business cycle are building, and unpredictable responses from economic actors will make it difficult for policy makers to secure a soft landing. In the physics lab, it is not difficult to manage the speed of an object in motion. The exact amount of force needed to achieve a desired direction and velocity can be derived from simple calculations. By contrast, modulating the pace of economic growth is far less precise and more perilous, because the objects in motion are people, firms and markets. We’ve only had one clear example of an economic soft landing where the force of policy slowed an expansion without stopping it. In the mid-1990s, U.S. inflation began to rise after several very strong quarters. Through a sharp increase in interest rates, the Federal Reserve was able to reduce growth and inflation to more manageable levels without creating additional unemployment. In retrospect, getting the economy to settle down gently was an extraordinary feat. Actions from policy makers and responses from those affected by them are separated by long and unpredictable lags, which is like steering a car and not seeing a change of course for several miles. (At which point you might have run off the road.) The reactions are not always predictable; people are not miniature cars on a track, and a multitude of forces act on them simultaneously. Further, behavioral science has proven that consumers and investors are not nearly as calculating as classic economics would assume; both are prone to extremes of exuberance and anxiety. Confirmation bias is a common affliction: a sense that times are good leads people to give more credence to news that suggests that times will stay good. In this sense, psychology can be inertial; it will not change until something forceful acts upon it. And when that force presents itself, it can provoke immoderate reactions. The rush to conservatism when performance is threatened can go well beyond what fundamentals might warrant. This is why boom/bust phases occur in business cycles and markets. 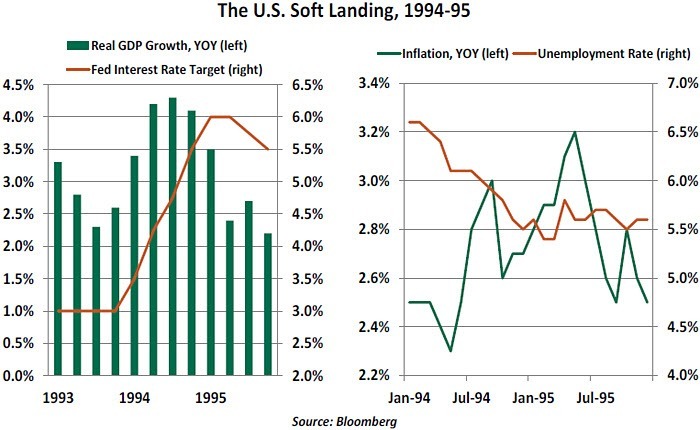 Twenty-five years ago, Greenspan pushed overnight interest rates up by a full 3% in a little over a year. The program was not well-previewed; the bond markets, in particular, scrambled to find a new equilibrium. 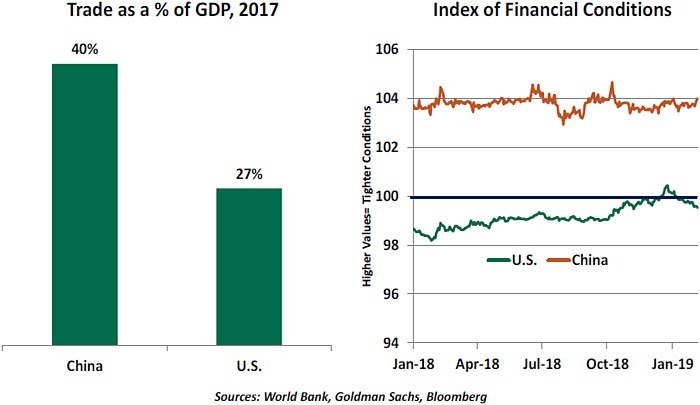 But the investment community and the American public had such faith in Greenspan that they did not lose faith that the expansion would be preserved. Back then, it also helped that the factors bearing on growth and confidence were largely domestic. Imports, exports and international capital flows were a fraction of what they are today. Algorithmic trading was in its infancy. Communication from policy makers was less frequent, and social media was not a factor. Producing a similar result today involves a much higher degree of difficulty. China and the United States are both currently engaged in searches for soft landings. Trade, monetary and fiscal policies are all in states of flux for both nations. Together, the two economies account for more than a third of the world’s gross domestic product; if one, or both, of them falter, other countries will be drawn into the malaise. China’s moderation looks more serious. It began with efforts to clamp down on excessive credit, and has been accentuated by trade frictions. China has the advantage of immense reserves and a level of market control not seen in Western nations. China also has tighter control over the information that is available to the public, which can help shape and contain behavioral reactions. But it is far more exposed to a trade war, and anecdotes suggest cracks are developing in the Chinese labor market. My fondness for physics ended when we got to electromagnetism; I could never conceptualize the forces created by currents. China and the U.S. are at opposite poles of today’s biggest economic friction, but they will only achieve soft landings if they appropriately manage the forces that threaten to separate them. Nearly 70% of U.S. economic output stems from personal consumption. The country’s 260 million adults spent over $13.3 trillion in 2017. Consumers are a vital part of the U.S. economy, with an appetite for imports that benefits many other countries, as well. It’s therefore essential to know: How are consumers feeling? Two surveys help us gauge the consumer outlook. The University of Michigan launched its Surveys of Consumers in 1946. It publishes a headline Index of Consumer Sentiment, supported by indices of consumers’ views of current economic conditions, expectations of future performance and expected inflation. The survey is administered by telephone, with at least 500 consumers surveyed every month. Participants are chosen using random digit dialing of mobile phone numbers; demographic data collected in the phone calls ensure a representative nationwide sample is collected. The Conference Board has conducted the Consumer Confidence Survey since 1967. This survey is conducted each month using a questionnaire sent by paper mail. Though mail is a slower medium, it ensures geographic dispersion. Participants are chosen at random from lists of known residential addresses. The target sample size is at least 3,000 responses each month. All methodologies have their limitations. The Michigan approach will miss consumers who do not have mobile phones; the Conference Board could not reach the homeless or people who are away from home for long intervals; both surveys have language constraints. But overall, each survey yields a representative sample of U.S. consumers. The two surveys are not directly comparable, as they ask different questions and are indexed to different baseline years. The Conference Board index has swings of greater magnitude than the Michigan survey. However, they move in tandem. The numeric values they report are not meaningful in themselves, but their changes and levels relative to their history can give insight. The surveys are anchored in opinions, and humans are temperamental. People can change their opinions quickly in response to news and prevailing circumstances. We do see the surveys demonstrated that consumers felt recessions as they took effect in 1990, 2001 and 2007. However, both surveys have shown notable declines that, in hindsight, were not substantial events. The indices showed significant month-over-month declines in 1987, 1996, 1998, 2003, 2005, 2011 and 2016. Some of these can be explained, such as the Black Monday stock market crash in 1987, while others are puzzling in hindsight. Whatever the motive, consumer sentiment was sensitive to circumstances that proved to be minor events. We are therefore somewhat skeptical about using consumer survey results as leading indicators. 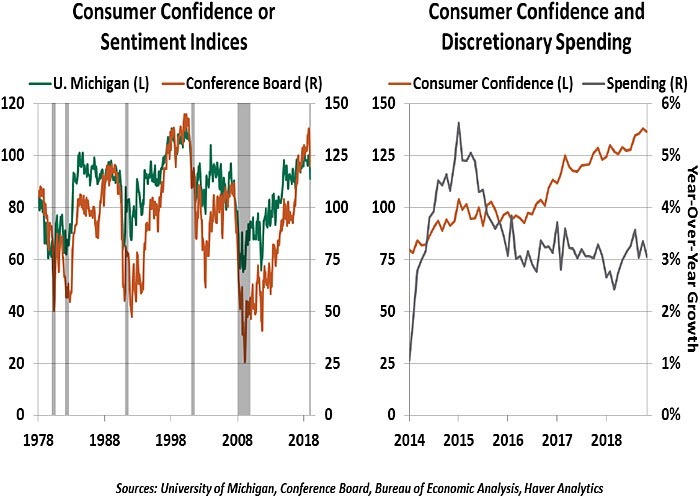 The sharp increase in consumer sentiment over the past two years has not been matched by a commensurate increase in spending; the latter is much more closely related to things like employment and the strength of the equity markets. However, consumer opinion can have great value in specific sectors. The surveys include questions about the respondent’s near-term intentions for major purchases, such as homes and autos, which are valuable to those markets. In January 2019, both indices posted month-over-month declines. We are not inclined to worry at this time. The year 2018 ended with stock market losses and a government shutdown creating uncertainty. Already, markets have recovered, the shutdown has ended and the January employment report was strong. We also observe that, despite the decline, both surveys are hovering at historically elevated levels. Consumer spending has been strong throughout the current economic cycle. As long as employment stays strong, we expect sentiments to remain elevated. Italy has slipped into recession for the third time in a decade. Amid the diverging macroeconomic fortunes among the core eurozone economies, Italy clearly stands out as a weak link. 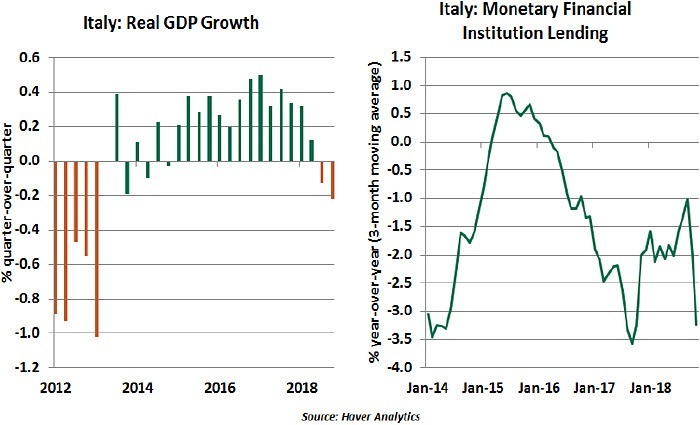 While the slowdown in some key European nations can be explained by transitory factors, Italy’s retreat appears to have been a result of persistent political turmoil that has fomented financial market turbulence and dampened business confidence. Deep-rooted structural problems such as low productivity growth, high public debt and a complex bureaucracy further complicate Italy’s situation. Entering 2019, leading indicators for Italy suggest the first quarter will likely be as bad as the last one of 2018. Prospects for the second quarter and beyond aren’t bright, either, with proposed value-added tax increases in 2020-21 looming on the horizon. The Italian banking sector is still in relatively poor shape, and heightened uncertainty will hurt the ongoing recovery. Credit growth has been trending down. The bad news will move focus back to the country’s budget, which has been the source of substantial friction between Italy and the European Union. The coalition government’s assumptions about economic growth now appear wildly optimistic, meaning that planned outlays may have to be cut. Barbs going back and forth between Rome, Paris and Brussels suggest consensus will be difficult to achieve. A weak outlook from Italy will also make the European Central Bank rate hikes even less likely and raises the question of whether the curtailment of quantitative easing, announced in December, was appropriate. Though we consider it unlikely, new elections this year would only exacerbate the situation. Negative sentiment can quickly spread to other regional economies that are deemed safe today. Fiscal space to fight the next recession is also a serious concern for Italy, along with other indebted nations such as Spain and France. Prolonged weakness will not only be bad news for the Italians, but also for the rest of Europe, as it will heighten the uncertainty and vulnerability of the region. Luigi Di Maio, the Italian deputy prime minister, recently said the country was on the cusp of an economic miracle that would parallel the one experienced in the 1960s. Italy certainly needs one. The information herein is based on sources which The Northern Trust Company believes to be reliable, but we cannot warrant its accuracy or completeness. Such information is subject to change and is not intended to influence your investment decisions.